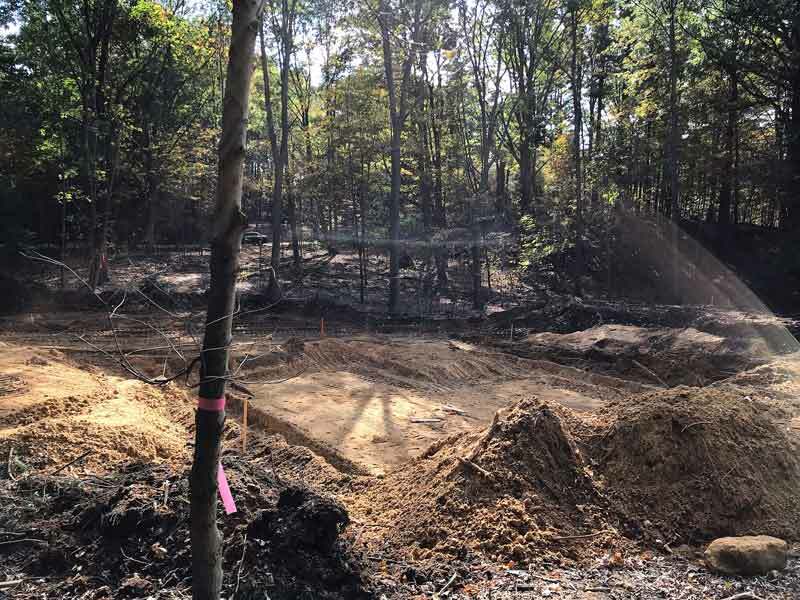 We enthusiastically anticipate ground-breaking for Bridge House near the shores of Lake Michigan on a wooded lot in Douglas, Michigan. 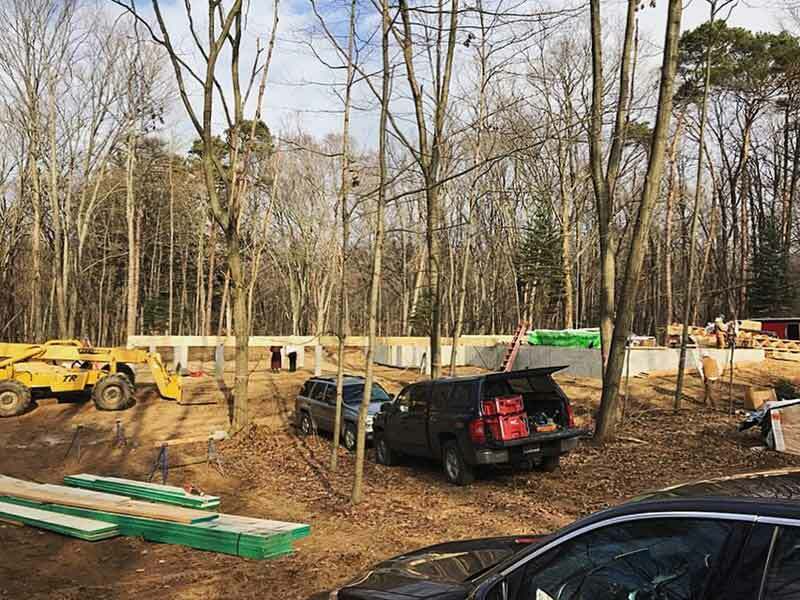 Our clients have enjoyed vacationing in the area for years, and have thus decided to build their dream retreat to semi-retire to the area, moving from their current home in Zionsville, IN. 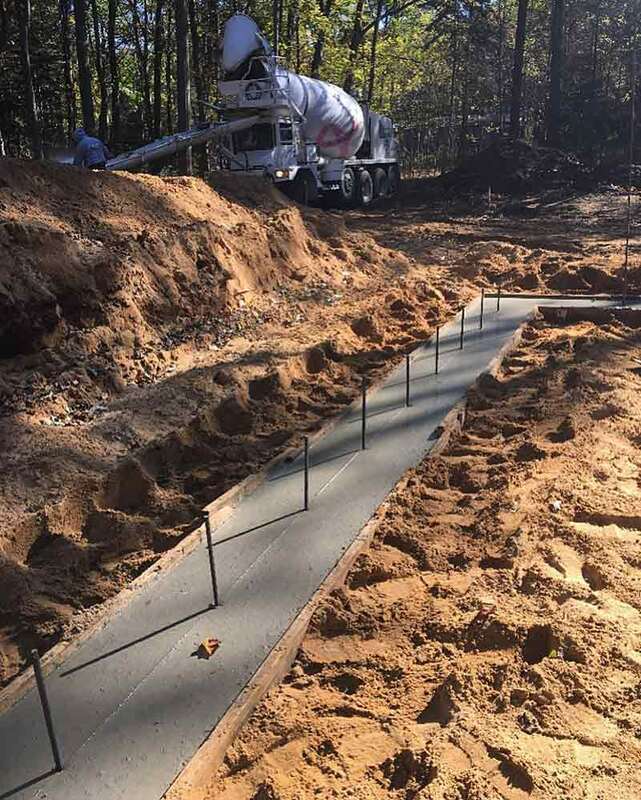 We have been working on the project since fall 2017, and it has been a pleasure working with these special clients! This one will absolutely be worth checking back for progress, so we’ll be sure to post regular updates! 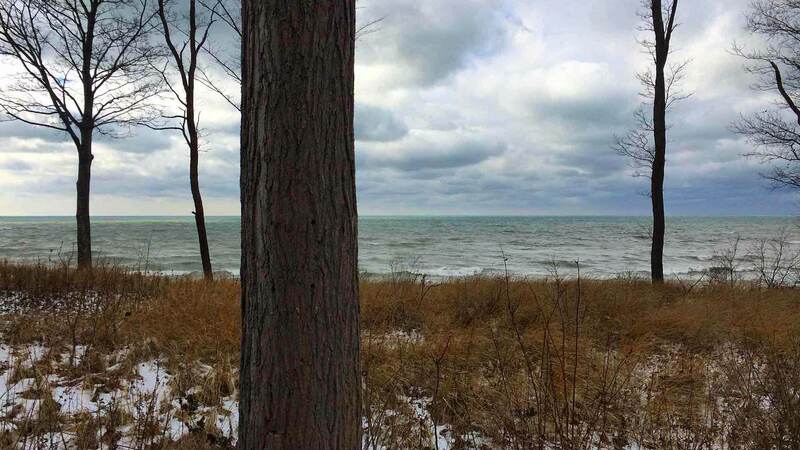 The lakefront area is mostly a seasonal retreat with bed & breakfasts and rental cabins with a sprinkling of full-time residents. So in winter, not many people are around. This day was stunning, but the stiff breeze from the lake was chilling. 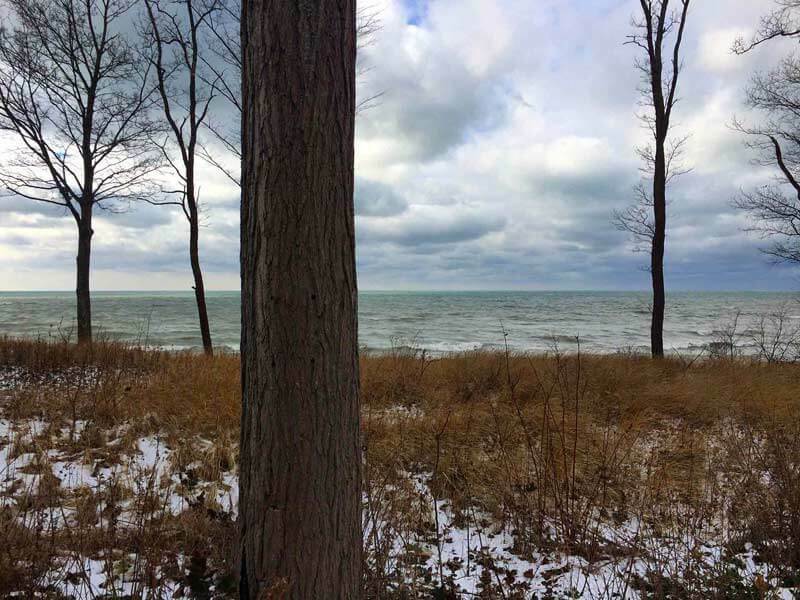 Lake Michigan waterfront photo 1/4 mile from the Bridge House site location – Douglas, Michigan (December 2017). Assembling an excellent team that communicates effectively and enjoys working together is a recipe for success. 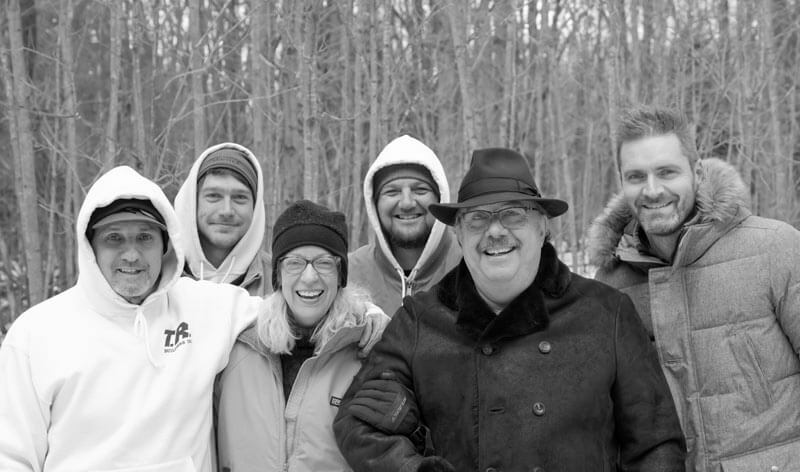 PreConstruction Site Visit 2 – Team Photo, Owners (center), Builders (left), Architect (right) – Bridge House – Douglas, Michigan – Lake Michigan (December 2017). Our first opportunity to see the site in-person occurred in October 2017, early in the design process. It was certainly important that we get a lay-of-the land first-hand. 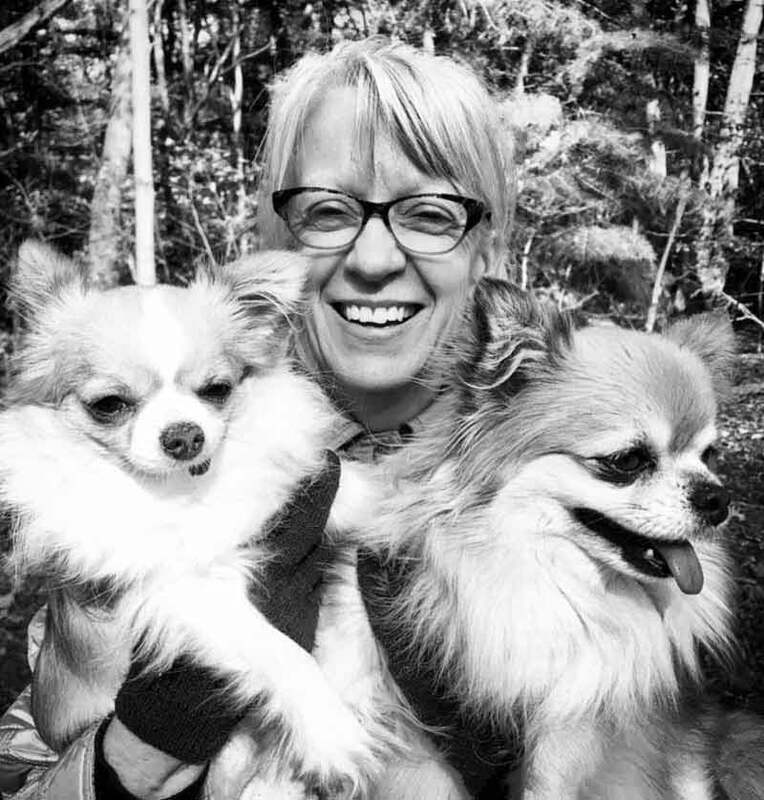 On prior visits, our clients had already verified that Theo and Piper approve of the location! We were fortunate to meet Tom Rigney (T.R. 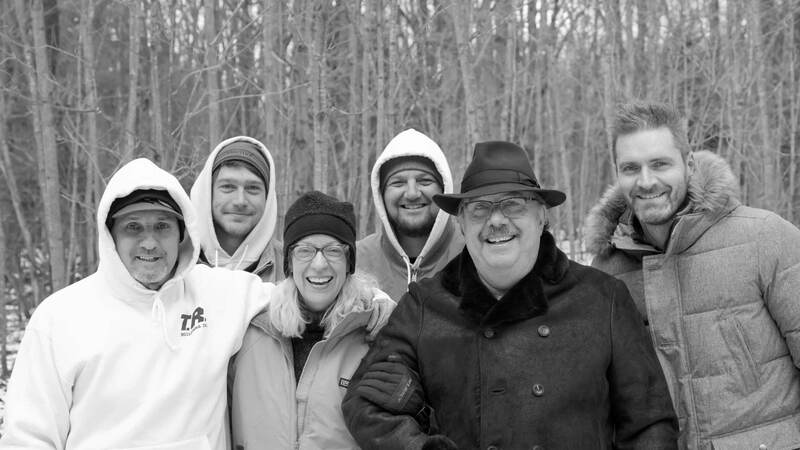 Builders) through another of our clients while working on their Michigan property a few years ago (Gull Lake Island). We enjoy Tom’s excellent communication and sincere interest in good collaboration and were confident that our pre-existing relationship would translate to the Bridge House project . Tom has recently worked on houses by Architects from Chicago and Michigan, including John Eifler, FAIA (Eifler & Associates, Chicago), who is known for historic renovations to homes and buildings by Frank Lloyd Wright, George Maher, Walter Burley Griffin, John Van Bergen and Louis Sullivan. Tom is also just finishing-up a residential project by Norman Carver, Jr, an esteemed Architect from Kalamazoo, Michigan who designed many Mid Century Modern masterpieces from Michigan to Palm Springs, California beginning in the early 1950’s. 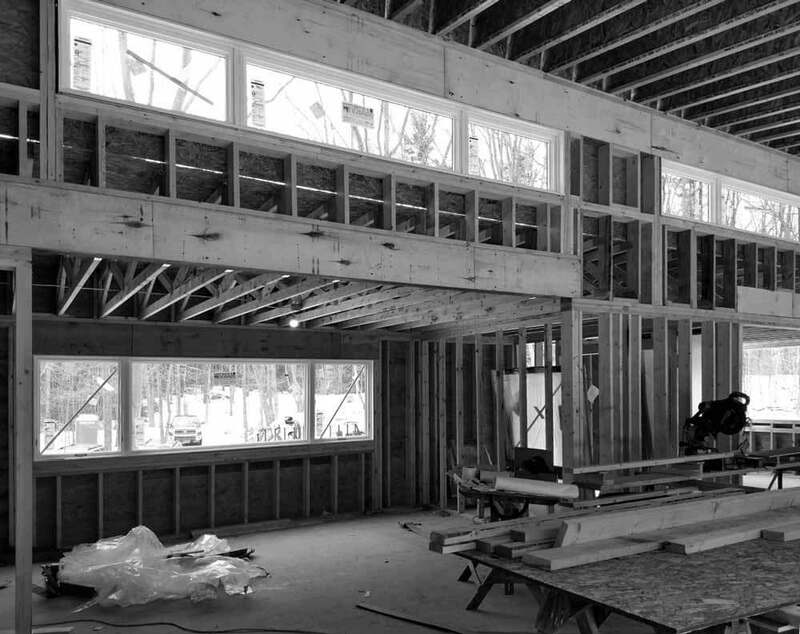 TR Builders has a great sense for detail, so we are confident having the construction in Tom’s hands. We’ll share more of the actual design process in the coming months. HAUS completed this sketch below in December 2017 as we were nearing the end of the SD-Schematic Design process. At this point we had explored a few design concept options and were leaning to this one. We had an overall scope established, and were in the process of reviewing budget options with the GC. As depicted in the building section below (in vague fashion), the design team with Owner have spent some time developing the interior architecture, with furniture and art integration. Our client has a wonderful collection of eclectic furniture and art that is going to fit right in to this project design and setting. Also, the owner and team is working with LEICHT on the kitchen cabinetry. For the entry bridge (see left background), we are discussing ways to deal with snow-ice. Perhaps we’ll consider a heating element along bridge length TBD depending on costs. After a long, detailed design and budgeting process, it’s really exciting to see the project finally underway! As we do with many of our projects, we are planning to share key phases of the construction process here. In general, we find the entire process really interesting. This is because there are so many moving parts and design decisions to be made even during construction. To be clear, Architect availability and involvement is really important during the construction phase. This is true for almost all construction projects, but especially ones like this involving a unique contemporary design. The drawings don’t stand alone and may not be perfect. Nor do they detail every important condition; therefore, the construction team will likely require Architect interpretations of design-intent. 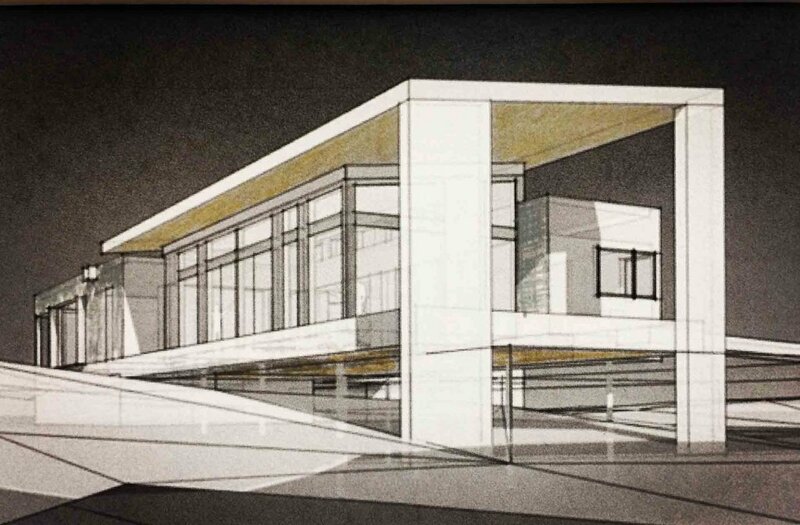 And with this project in particular, with Architect a 3.5 hour drive away, site visits will not be frequent. However, our client and T.R. Builders have promised to stay in-touch with questions and share progress photos for feedback. Since we had such a natural, untouched, landscape, one original goal was to tread as lightly as possible. As one can see here, the initial excavation is still making an impact. 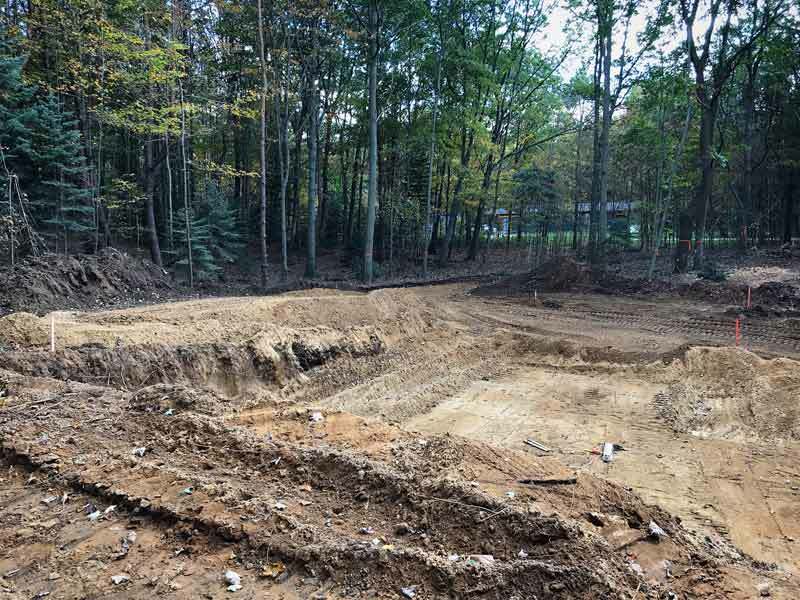 The east portion of the project sinks into the land for basement which anchors the house to the ground laterally. 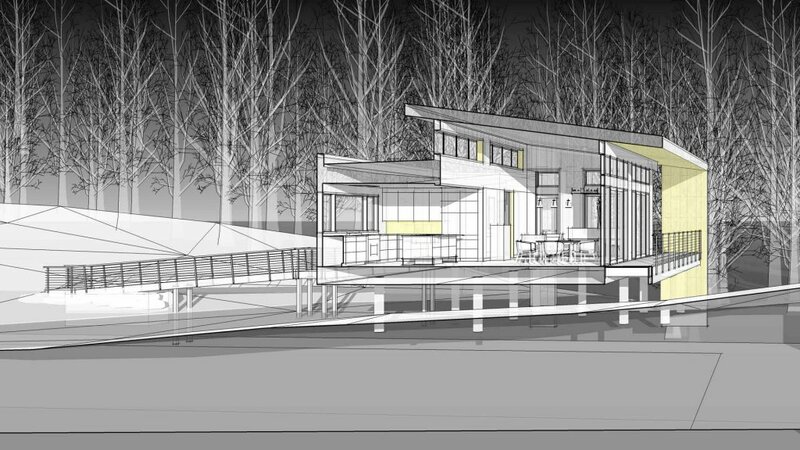 Then the remaining 65% of the house will hover on stilts over the landscape. 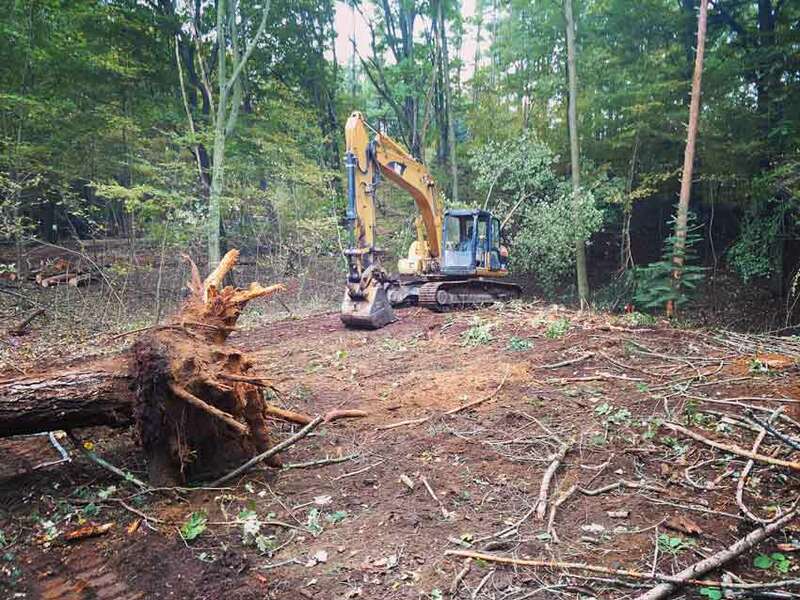 TR Builders cleared a few trees for the construction as well, in addition to a few in poor health. In the end, we’ll be able to re-establish the original grades and supplement with native landscape. We are working with a local landscape company on the final site design strategy. 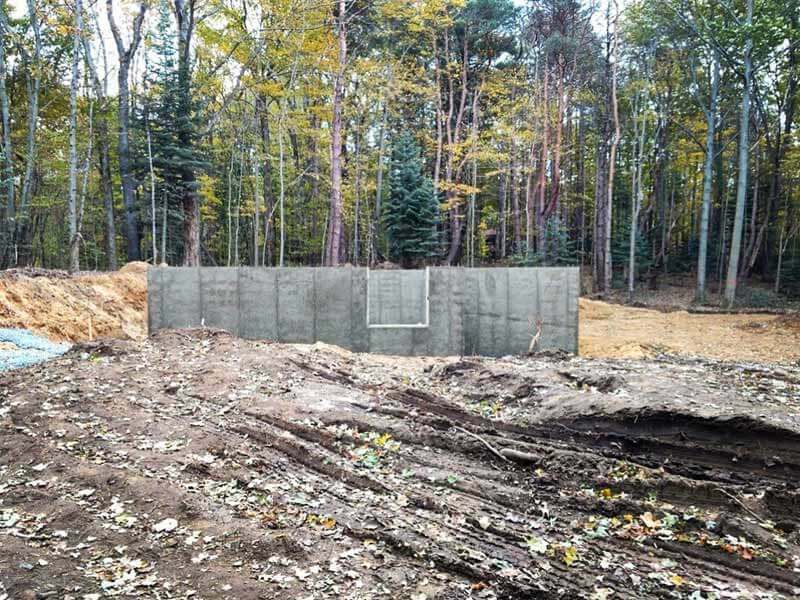 Basement walls have been completed, so next steps are to include garage area + bridge piers. 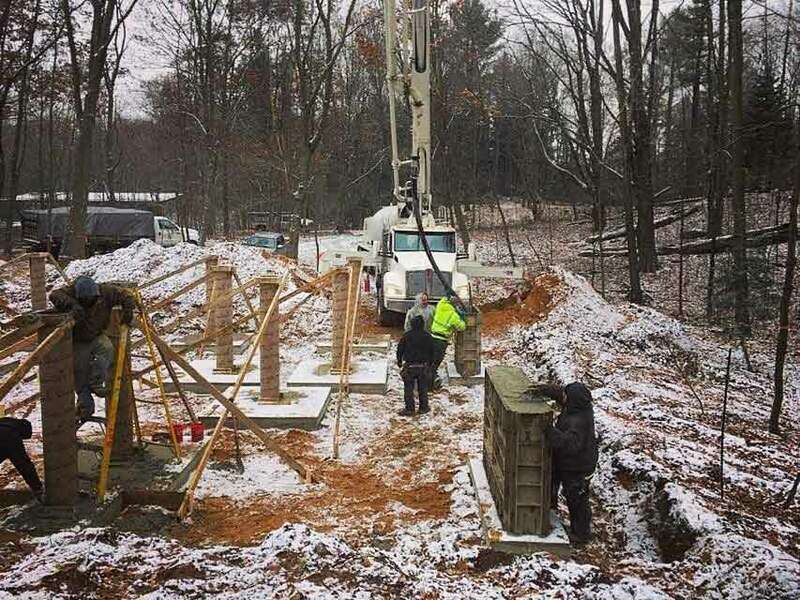 TR Builders called us while they were working on pier forms to clarify a few things. Albeit, we’re glad they called, because as we were looking back at our drawings it forced us to review and cross-check some things. Specifically, the foundation drawings had a few discrepancies on pier heights that we were able to correct in-time. Without a doubt, this was a good catch by the team and will enable us to achieve exterior siding + deck fascia alignments as intended. With a unique design, there are atypical conditions that need special attention in the deign process and construction, like the pier condition below. For this design, it was important to us that the siding and deck fascia maintain a continuous alignment around the perimeter. Since the siding overlaps the plate and top of basement wall a bit on the basement areas, it needed to maintain the same elevation at the pier conditions. 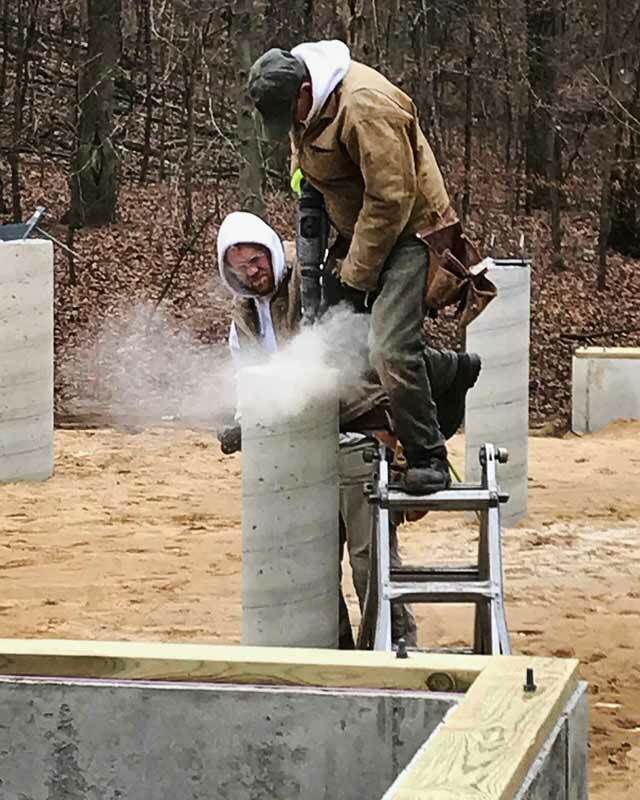 To accomplish this, we design the tops of perimeter piers to drop lower than top of basement walls to allow siding to pass unimpeded by the piers since piers may stick-out proud of wall finish conditions (we didn’t want to have to raise the siding or cut around the piers in these areas). 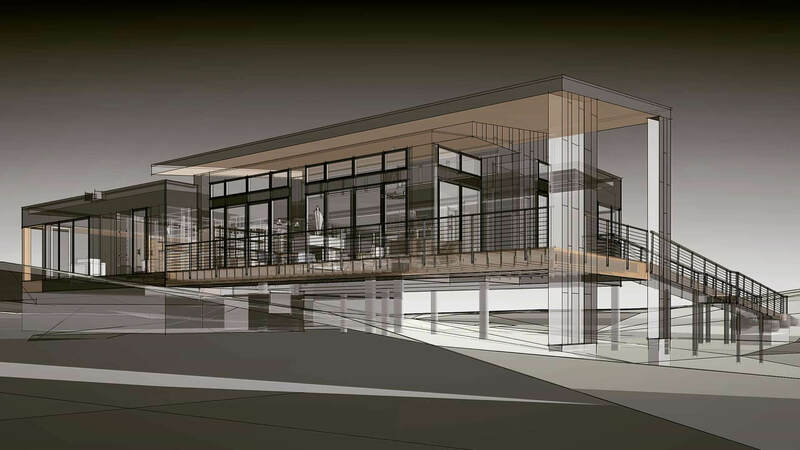 During the pricing process after we completed the design drawings, the team agreed on all engineered wood beams in lieu of the original steel beams proposed by structural engineer (cost savings and simpler to install/coordinate). We did not completely update all drawings and details to reflect an all-wood condition, which led to some misunderstandings about how to frame the perimeter beams. 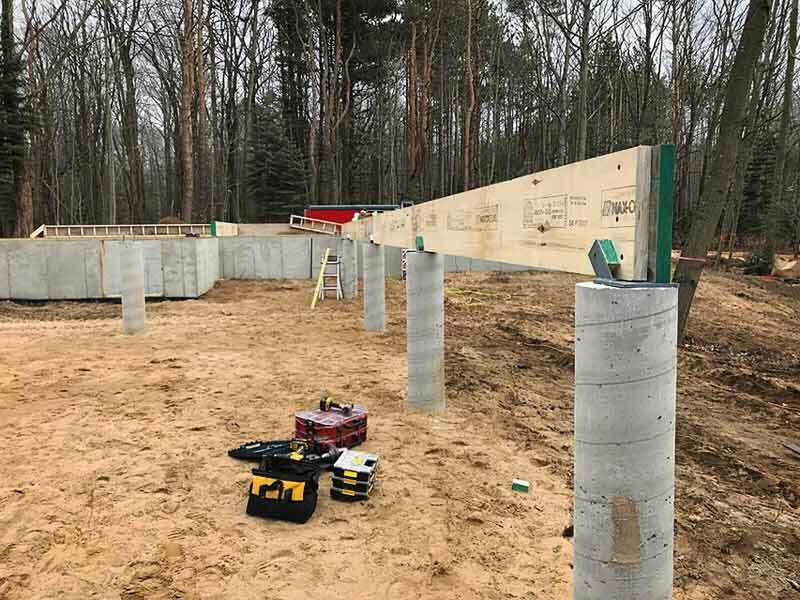 Architect had detailed perimeter beams to shim-up from the dropped perimeter piers to achieve the aligned siding condition and keep trims clear of piers. And whether steel or wood beams, the designed beam bearing heights were to remain unchanged, still in alignment with all other joists and trusses. 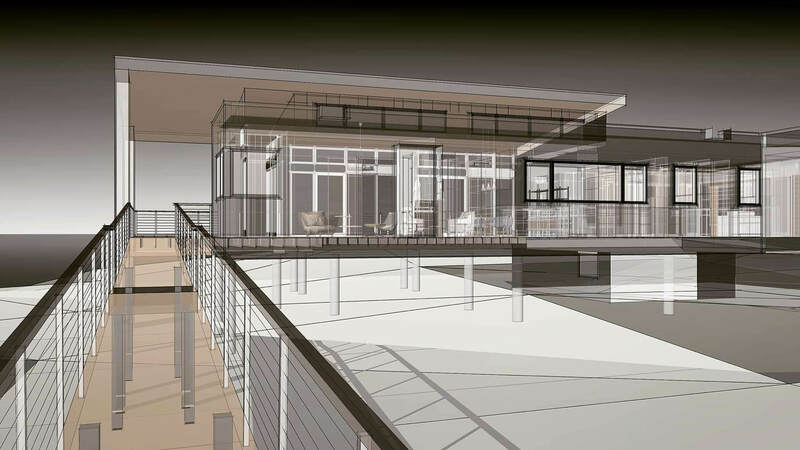 However, the structural drawings indicated a different typical detail for wood-to-pier connection that didn’t reference pier or beam elevations, or the Architect’s details noted above. 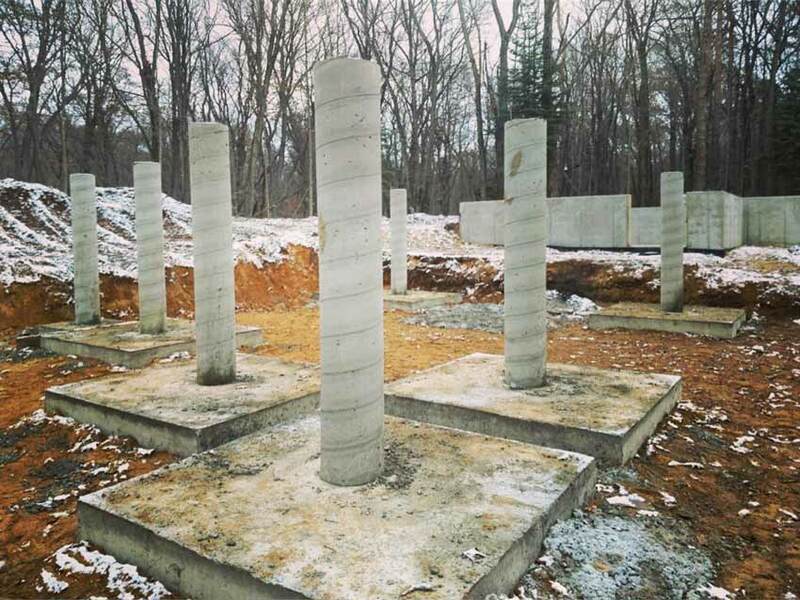 So as indicted in the photo below, perimeter LVL beams were dropped over the accompanying piers to more closely resemble the structural detail. Once we noticed, we reached-out to Builder to review the condition and make sure we were on the same page regarding the design intent. Architect was concerned that we didn’t have enough space under the beams for a cladding material and drying space for the beams. Builder shared their strategy to shim between beam and hardware with stainless steel shims to get the beams and floor laser-level. These shims will raise the beam up a bit from the pier and hardware. According to builder, they have already completed this work. So we are looking forward to seeing the progress and floor deck installed. For the finish condition, we (Builder and Architect) agreed to wrap the beam undersides with brake metal to match siding. This solution will be very close to the original intent as the dropped beam will still be behind the siding, and the thin brake-metal beam cladding will not touch the concrete piers. We think this is a good compromise since the floor framing had already progressed forward. This detail and related communication seemed to get a lot of people riled-up. We’re happy that the build team takes as much pride in their work as we do, and look forward to ongoing progress and constructive dialogue about the details. Floor framing appears to be complete, and perimeter walls are speeding forward! Exterior deck framing will come later (see far-right deck piers). Notice the insulated headers in the lower left corner on the ground. 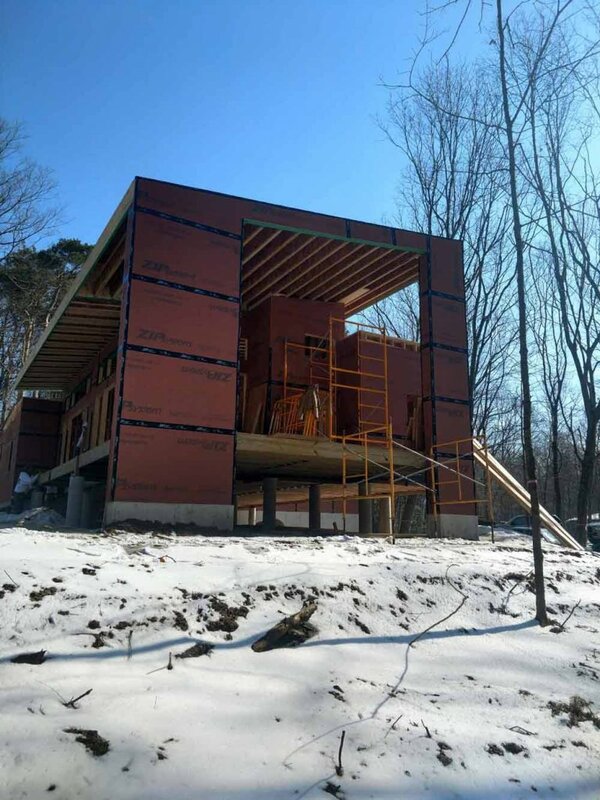 This is an important detail on all projects in colder climates! TR Builders sourced lumber from Builders First Source Northeast in Portage, Michigan (Contact: Adam Bradley). 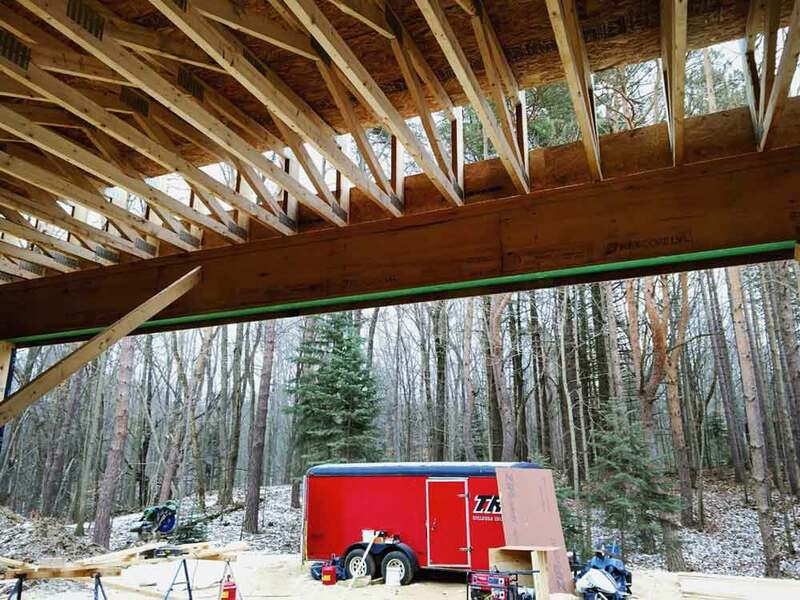 All interior floors are wood trusses with built-up LVL beams over piers. 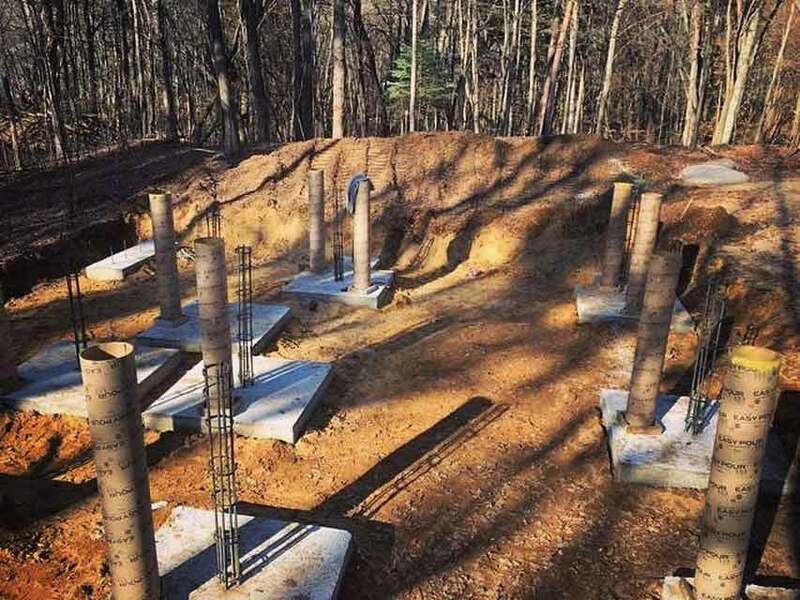 Photo below shows floor truss framing over the basement foundation. 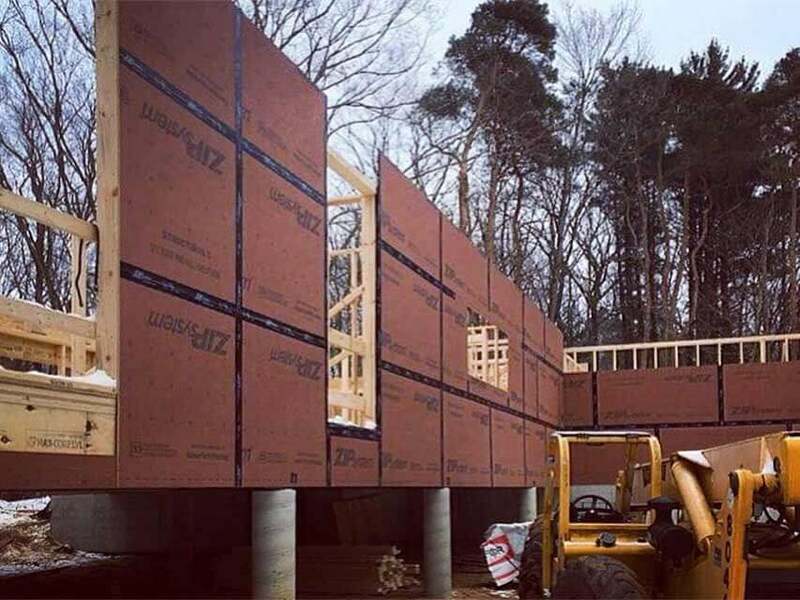 Zip System Sheathing is really making inroads in the wood-framed marketplace, and we’re happy to see it installed on Bridge House. 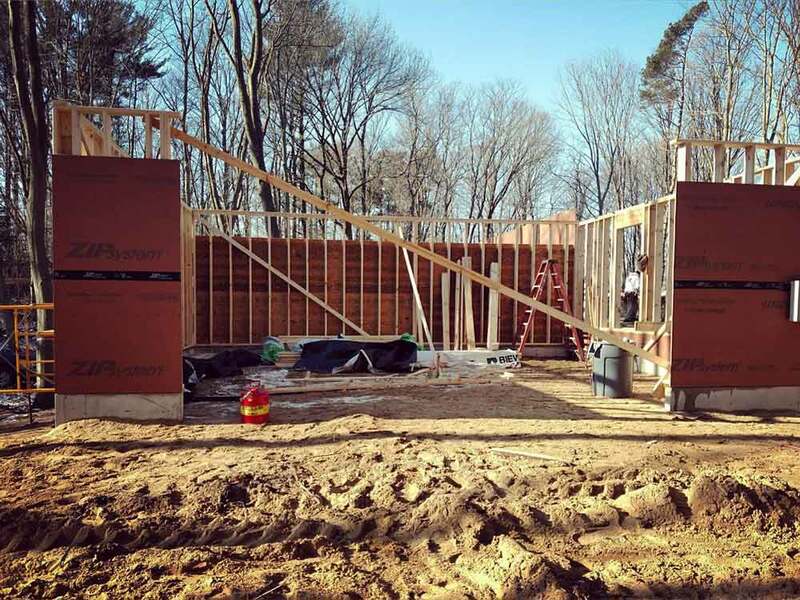 We considered other framing methods during the pricing stage (like SIPS), but elected to stick-build based on budget. However, we did go with 2×6 walls to enable more insulation. Besides, the taller living room walls needed thicker studs anyway based on height and roof loading. Photo below shows front elevation with horizontal kitchen window to the right. It seems weather has been a bit warmer than usual so far for a Michigan winter, and no huge snows (yet – knock on wood). It’s fun to see walls going-up and dream becoming reality! Most of the roofs are flat on this project. 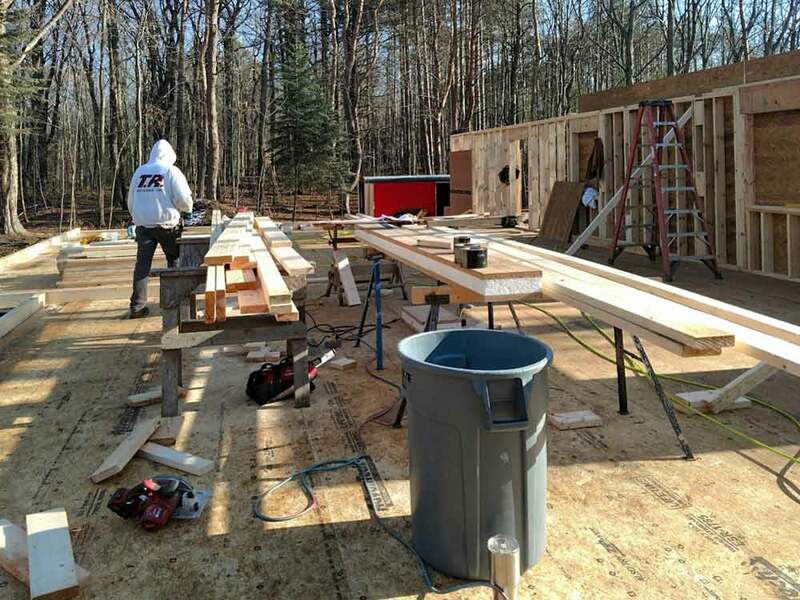 So to get the water off, we are utilizing sloped trusses sloping a minimum of 1/4″ per foot. 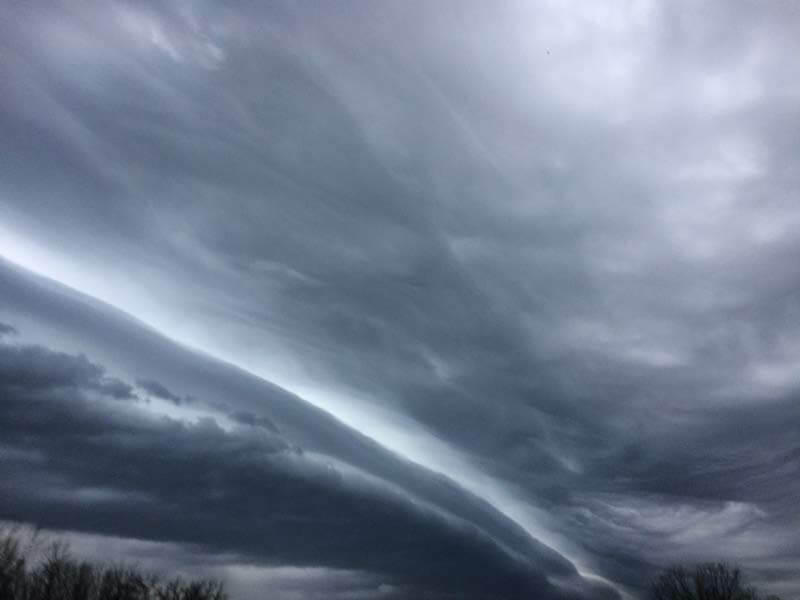 And since we are expecting debris on such a wooded site, we have designed wide-mouth open scuppers to allow water and debris to flow off of the roof to the site free of downspouts. 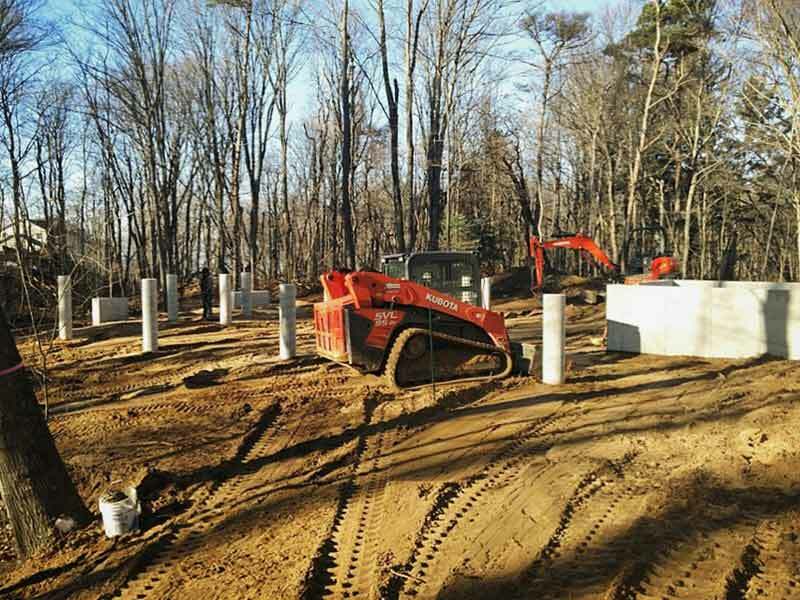 We’ll position boulders at-grade in these areas to manage erosion. We’ll not be ventilating the flat roof areas. 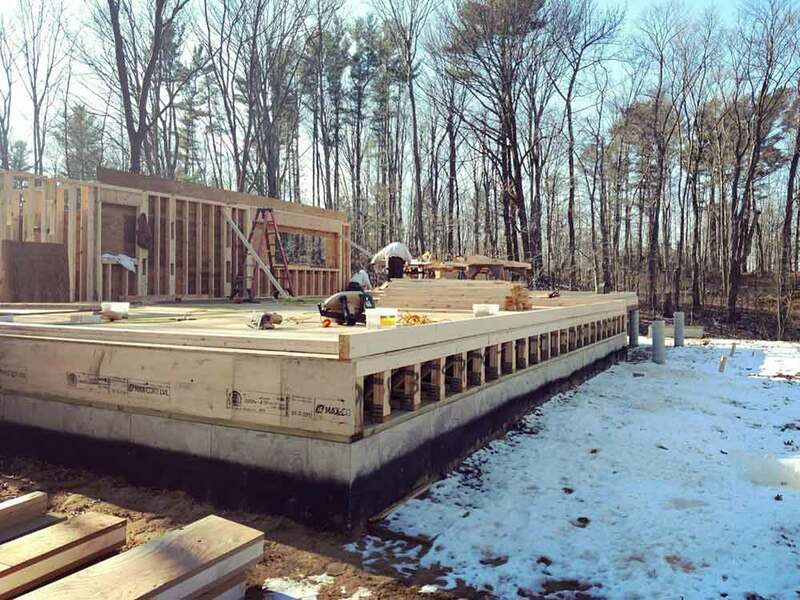 Instead, we’ll insulate to a minimum R-25 above roof deck with closed-cell polyisocyanurate or extruded polystyrene board insulation (to avoid condensation concerns per code). From there, we’ll install balance of open-cell insulation on the underside of deck to achieve the final agreed R-value. Even the view from the garage is stunning! 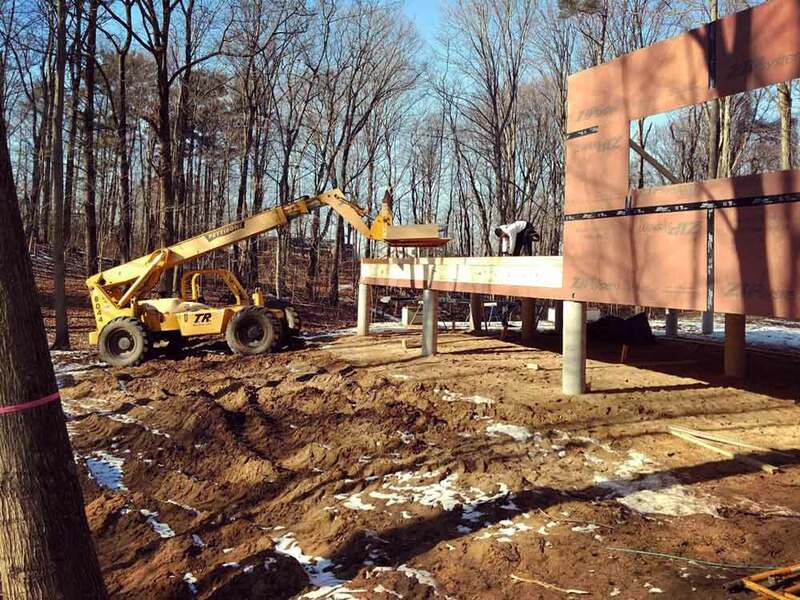 The overall enclosure is just about framed, and crews are finishing-up details in anticipation of window arrival. The Michigan winter has most certainly arrived, complete with frigid temps, wind-chill, and snow. 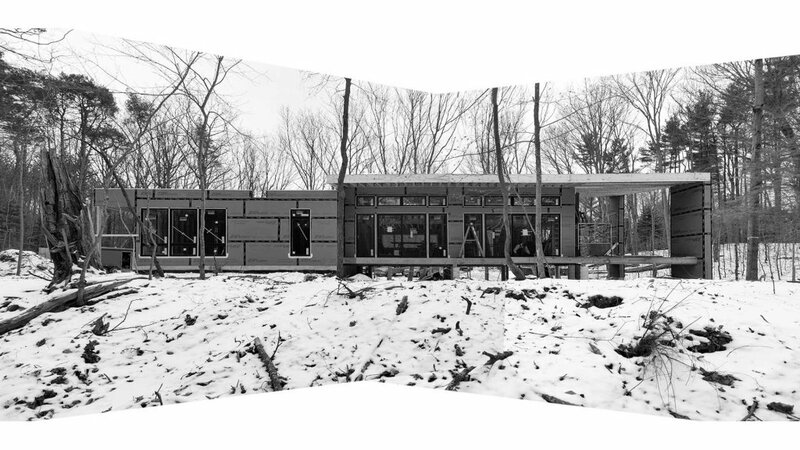 Entry porch perches above and overlooks existing topography drop-off, providing view through trees to Lake Michigan in winter months. North exterior elevation below elevates just enough to provide the best views to the deep natural ravine to the north. 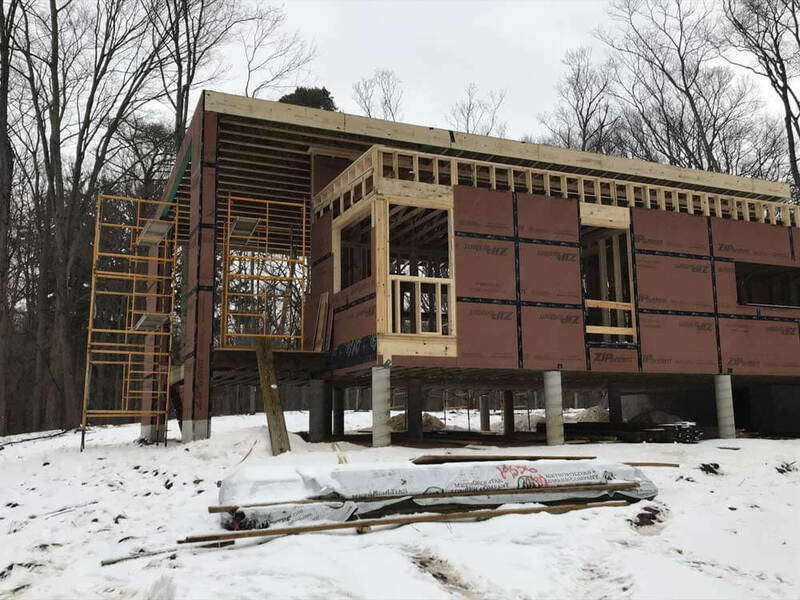 Crews just installed windows this week (Week of February 25th, 2019), so along with exterior sheathing and temp roof protection, crews are most certainly happy to focus on inside work. Next week temps are going to be brutal. We will continue with updates as construction progresses, so please check-back for the latest Bridge House news! 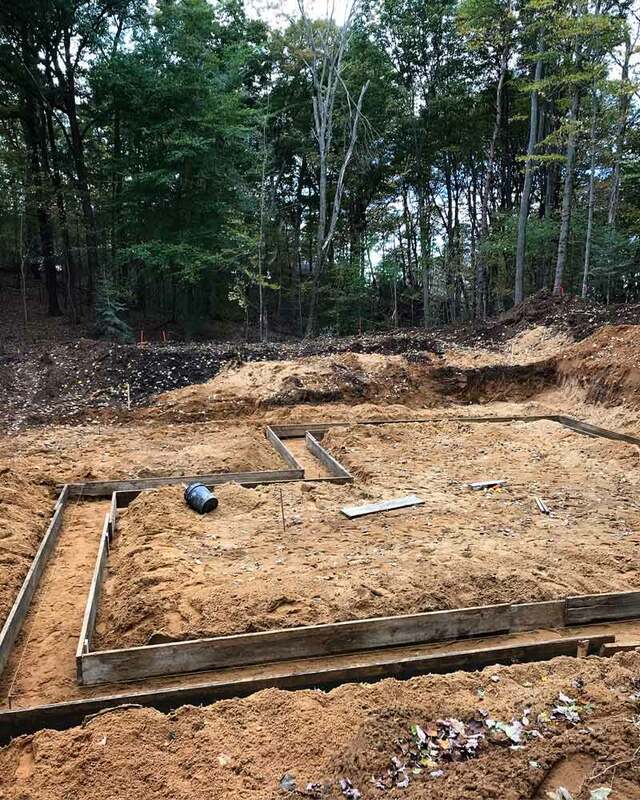 Will be awesome house and quite an experience building next to the Great Lake. Baby it’s cold outside!! Thanks, Kevin. 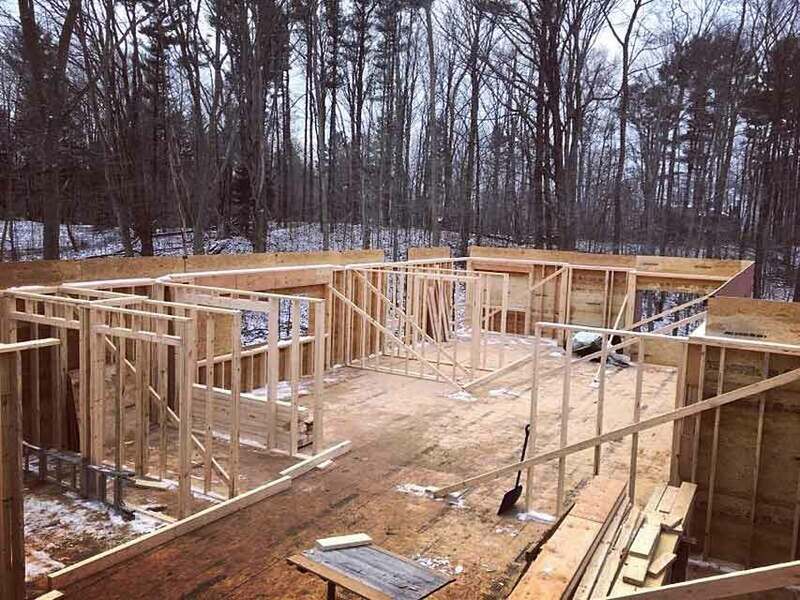 The framing progress looks amazing – great work!